Carrie Brunello is the Co-Owner of 11th Hour Staffing, Inc, a family owned, full-service recruiting firm offering services locally and nationwide for all industries, recruiting for both temporary and direct hire roles. She has over 10 years experience in recruiting, training, human resources and management. 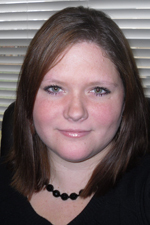 Carrie is a graduate of State University of New York College at Brockport and is PHR certified. Carrie is passionate about helping others and committed to serving our local community. She is actively involved with the local Chamber of Commerce’s, business organizations, and other community groups. She is an active member of Society for Human Resources Management (SHRM), Miami Valley Human Resources Association (MVHRA) and co-founder of Linked Dayton Metro. The Networking Chair is a volunteer position that reports to the Board of Directors. The Networking Chair is responsible for a variety of duties including assisting the Program Chair with the coordination of the monthly meetings, serving as a public relations agent with the local media and developing a reciprocating relationship with vendors. Greet speaker and meeting sponsor and ensure they have everything they need. Staff networking table and meet members at the door. Hand out/pick up speaker reviews. Develop relationship with local editors and business reporters. Publish meeting notices to the local media. Alert editors/ reporters of special workshops or programs of interest to the Dayton business community. Distribute news releases when applicable. Working knowledge of record keeping.